What a year it’s been. 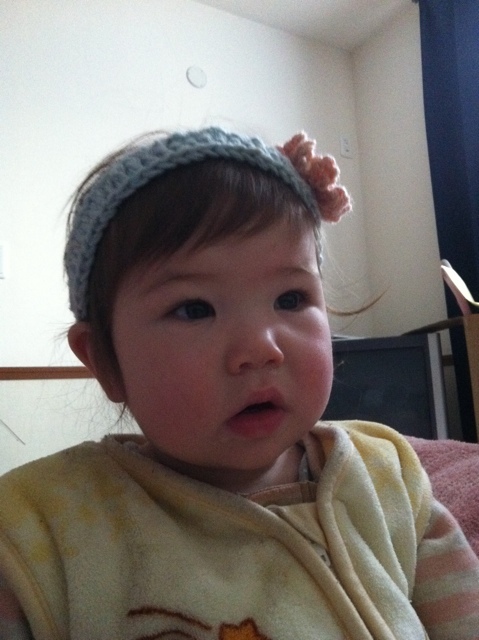 11 months ago, Tomoe was born. Now she’s walking. How time flies. Tomoe, born January 25th – Of course, this was the most popular. Tomoe, 1 day old – She was popular in the beginning! Take a guess! – Before she was born, I asked you to guess about her weight and birth time. 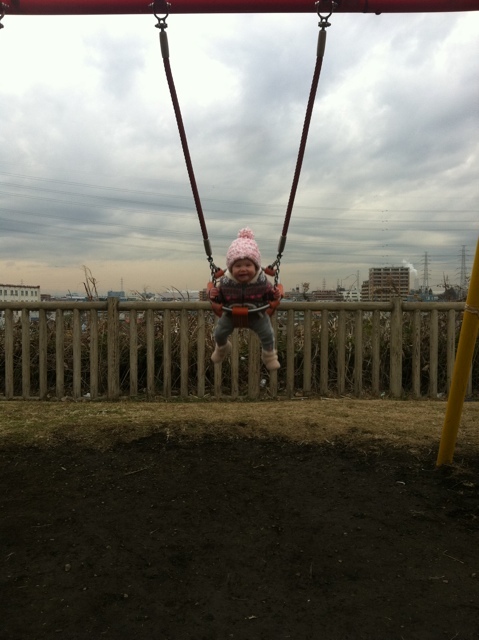 Tomoe’s day with a friend – A more recent day, only a month ago. The quest for the perfect diaper – This was a difficult decision! 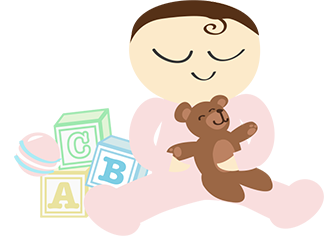 Week 35 – Still pregnant. This was posted on New Year’s Day. How do I feel about fatherhood? – I made this post shortly before Tomoe’s birth. The past 8 weeks in ultrasound – This is from early in the pregnancy. People are interested in ultrasound pictures. 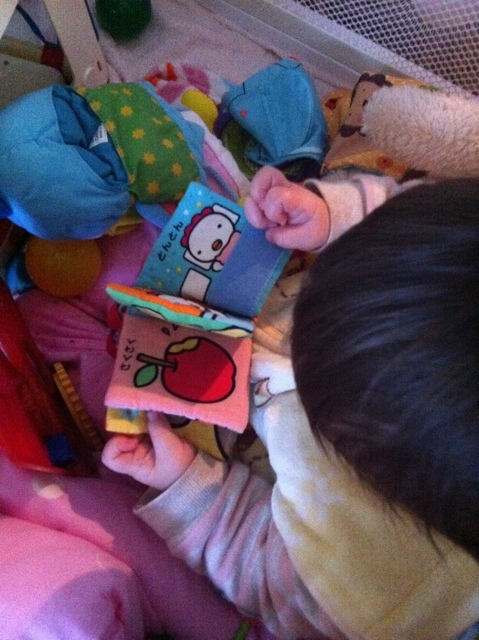 Moody baby discovers her hands! – A milestone. A new car for her 2 month birthday! – She got a baby carriage! So, those were the most popular posts in the past year. Not all of them were from this year, though. Amazing year! We’ve seen her lift her head for the first time, learn to smile and laugh, roll over, sit up on her own, start crawling, stand up with support, eat solid food, drink from a straw, react to her name, stand up on her own, get her first teeth, hi-5, raise her hand when her name is called, and more. What will she learn next? Oh yeah, she learned to wave tonight! I hope 2013 is even more exciting! Tomoe has discovered a new food she loves. 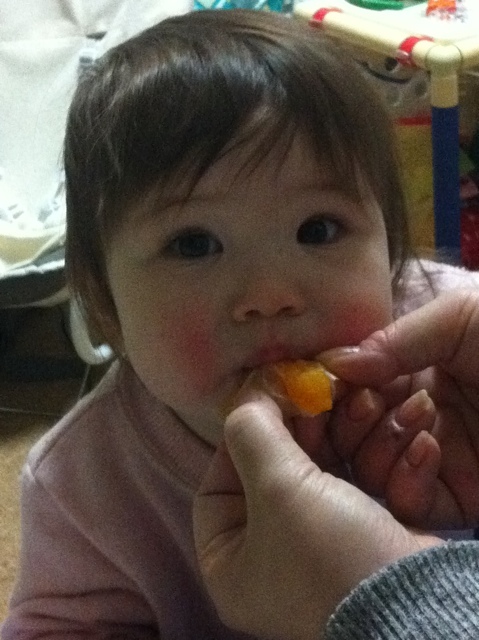 That’s mikan, which is known as Japanese mandarin orange or tangerine in English. 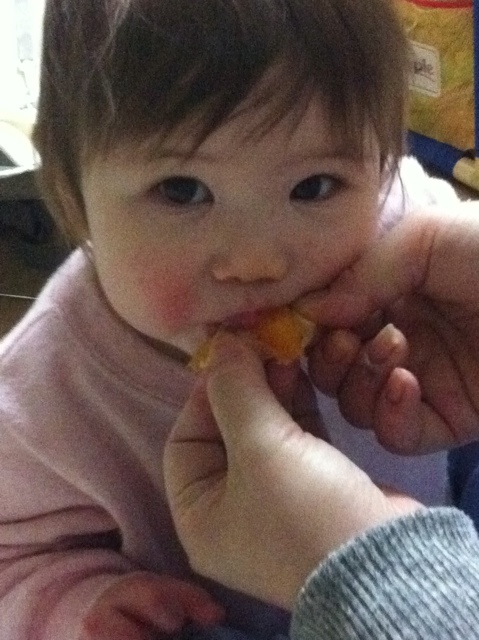 She doesn’t seem bothered by the sourness at all. Now that I’m on holiday, I have plenty of time to do many things that I enjoy. Blogging is one thing, playing Sims 2 is another, as well as reading books. But I’ll have plenty of time with my family and some bonding time with Tomoe. The next couple of days are going to be rainy, but I’ll play with Tomoe and get her to walk as much as I can. When it’s sunny, I’ll be taking her to the park to play, as well as practice walking. She’s doing great with that. But the big thing is January 1st. We’ll be going to Saitama for Oshogatsu, which is New Year’s in Japanese. We’ll spend the day at my in-laws’ home, probably eating sushi and drinking sake, as well as a possibility of going bowling. 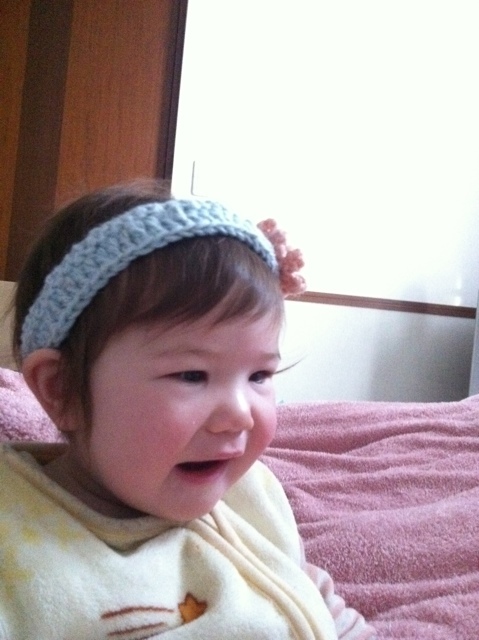 But I think the big thing is for Tomoe to see everyone, and for everyone to see how she’s grown. She’ll have a lot of people taking care of her. It’ll be a fun day for her, I think. After the New Year, we’ll be going to Zeniarai Benten in Kamakura. It’s a famous shrine where you can wash your money to wish for good fortune in terms of finances. It’s a fascinating place. As far as the blog goes, I’ll be doing a year in review post before New Year’s Day. Also, I received an award nomination, which I’ll have to considering making a post about. It’s Christmas Eve, and this has been the best Christmas season yet. What a great few days it’s been, and it’s not even Christmas Day. 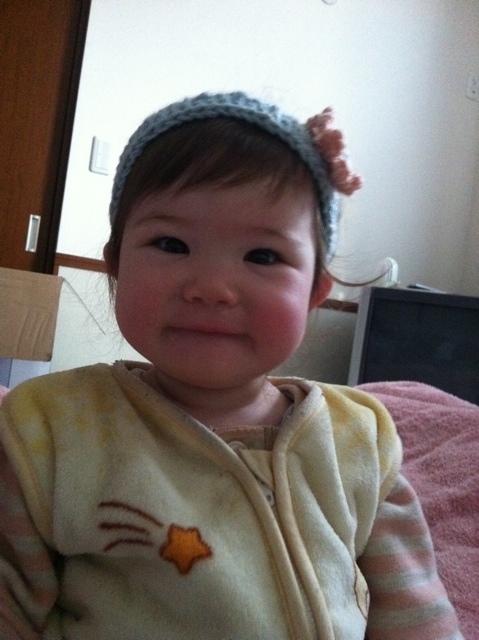 On Friday, we went to the clinic for Tomoe’s 10 month checkup, even though she’s about to turn 11 months old tomorrow. She’s in good health, and everything about her seems quite average. 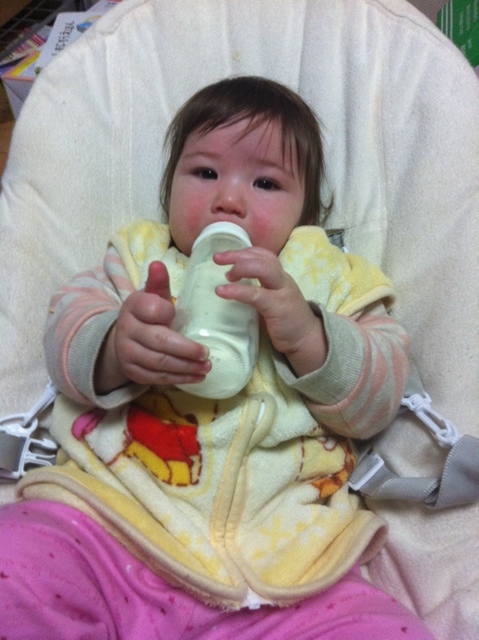 She’s now 9.3 kg and 72 cm tall. 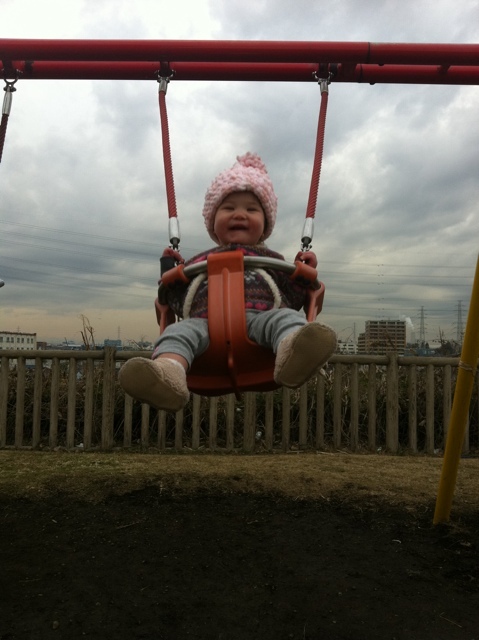 After the visit to the clinic, we went walking around the area, then went to the park so she could play a bit. 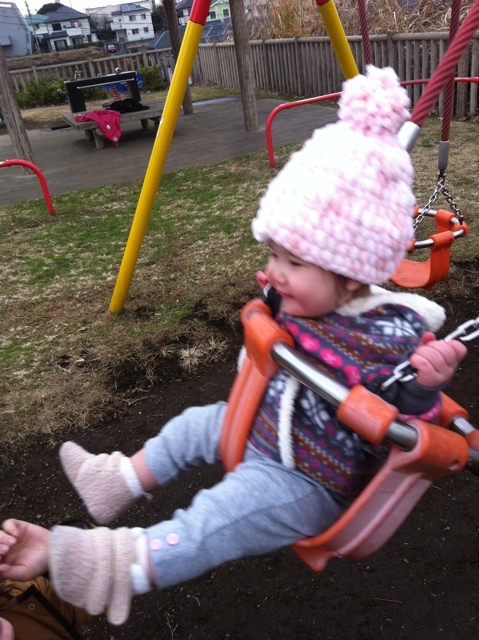 Of course, she tried a bit of walking with our help, and then went on the swing. She really loves it. And forward! Notice the city behind her? This park is at the top of a hill. Nice view! We can also see Mt. Fuji from there. 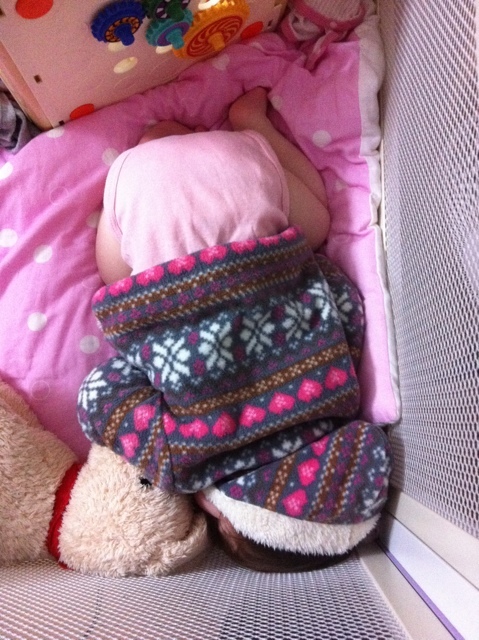 She was so sleepy when we got home, she fell asleep after she removed her pants. Last night, we went to a Christmas party held by my wife’s friend in Sagamihara. 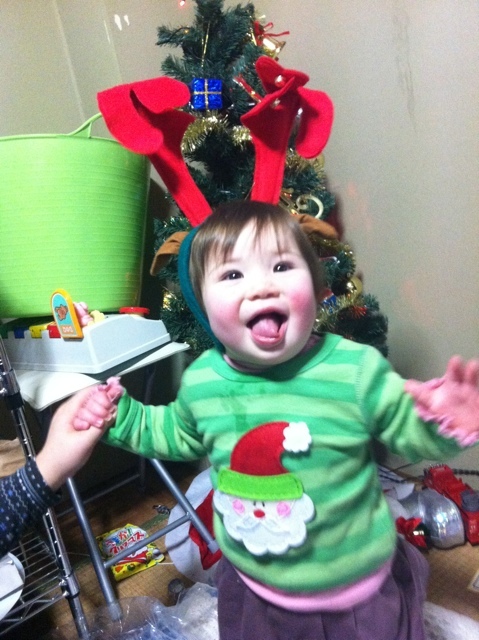 It was Tomoe’s first Christmas party. She got to meet a few other kids and their families. She was very outgoing and had a lot of fun. There were two other babies there, and when Santa came, Tomoe was the bravest. He was a charity Santa, and he brought presents that were already prepared by the parents. Tomoe didn’t cry, but another baby did. That was a fun party. But today is Christmas Eve, and Tomoe had a bigger surprise for us. She walked. For the first time, she actually walked by herself. She was cautious, but she did it! Not just once, but she did it three times! 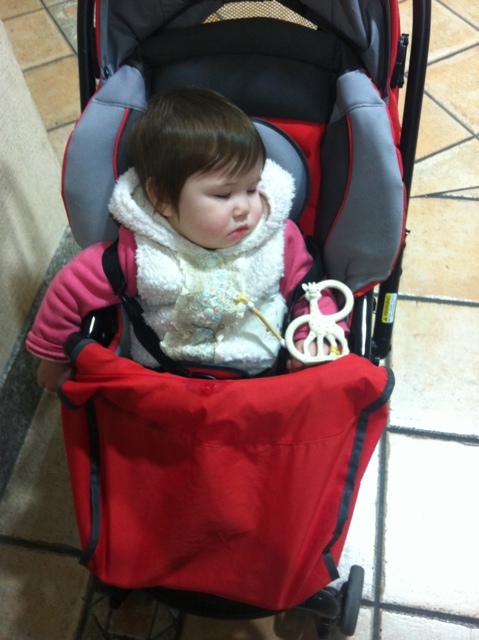 The day before her 11 month birthday, the day before Christmas, she could walk! Amazing! Today was amazing. Really gave me a good feeling all day. More milestones in such a short time! I can’t believe how quickly Tomoe is learning new things. She’s really growing up fast. First of all, she’s started pointing at things that she wants. She doesn’t use her finger, just points with her whole hand. We’re able to understand what she wants a lot more now. Second, she’s finally learned to clap. However, she doesn’t always get it right. After clapping, she holds her hands together and pumps them up and down. It’s quite funny to watch. 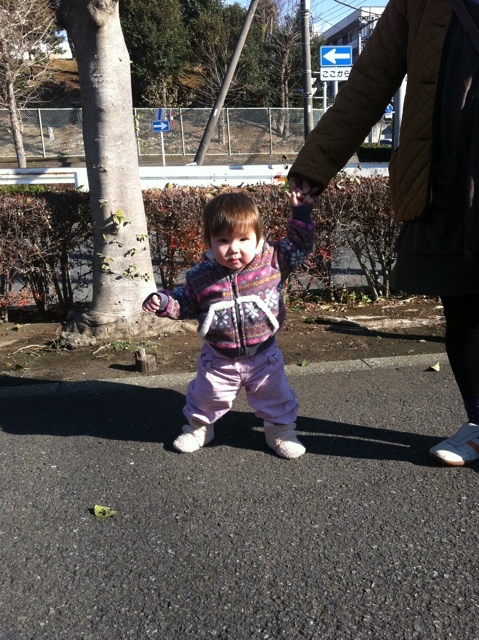 And then yesterday, she showed that she can get up from the floor and stand up without holding onto anything. That’s a really big step! But this is nothing compared to what she did today. As I was going to work, we took Tomoe outside to say goodbye to me. My wife and I each took one of her hands and let her walk between us. And boy did she ever walk well! I couldn’t believe it! She walked for about 15-20 metres before my wife picked her up. And as we got to the corner, she wanted to see her walk again. So, here are a couple of pictures. Looking at her mom’s feet? Or the shadow? I don’t know. Great pose. I love this picture! So, when will she walk on her own? I think it’ll be before the end of the year. Maybe she’ll be walking in time for our New Year’s Day at my in-laws’ house. Tomoe’s been pretty active lately with her development. Even though she’s had a cold, and is only now recovering from it, she kept going as if she was never sick. She’s almost achieved some milestones, though. Her ability to walk keeps improving. She’s been attempting to walk on her own recently, without us helping her. She keeps falling over, though. 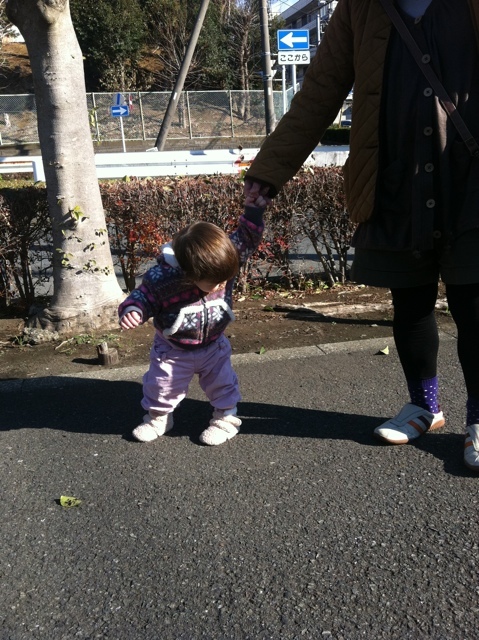 She’s managed one or two steps only, but she should be walking soon. She’s also been getting closer to clapping. 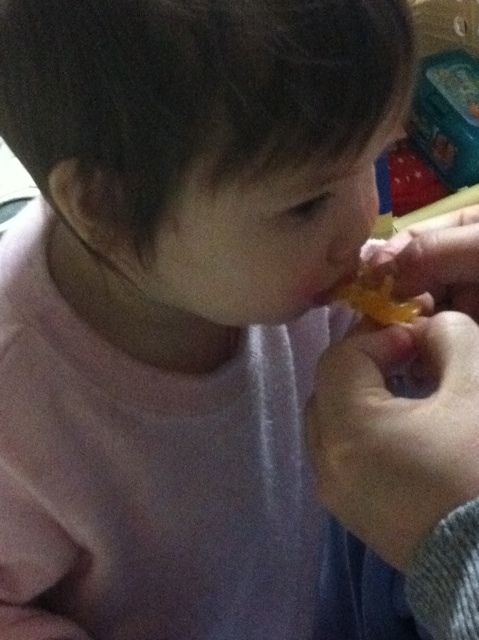 That’s normally a 10 month milestone, but she hasn’t mastered this skill yet. She did almost clap a couple days ago. Her hands came together instead of moving her arms up and down. But there’s one thing that she’s now doing that is an achievement. She’s hugging! Sometimes she wants to be picked up and holds her arms up, but other times, she’ll grab hold of my waist and hug. She also holds onto me very well while I’m holding her. Last week, she had her last vaccination for a while. This one was for polio. Next year, she’ll get some booster shots, but not at the frequency she’s received shots in the past few months. And the great thing is, she never cried once! 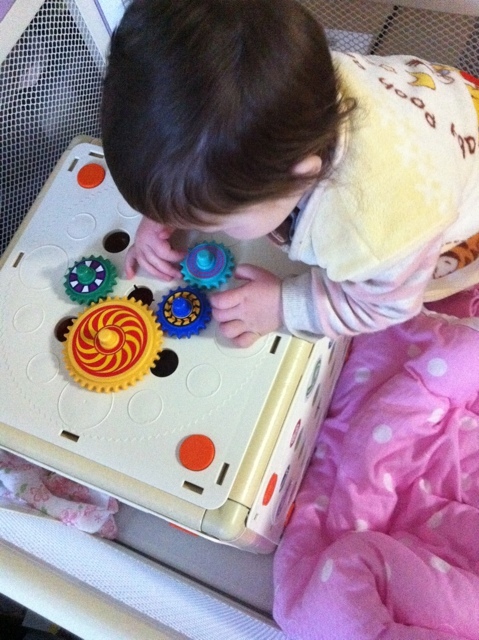 She loves playing with these gears. They must be her favourite toy. Looking at a book now. She seems to turn the pages on her own now. 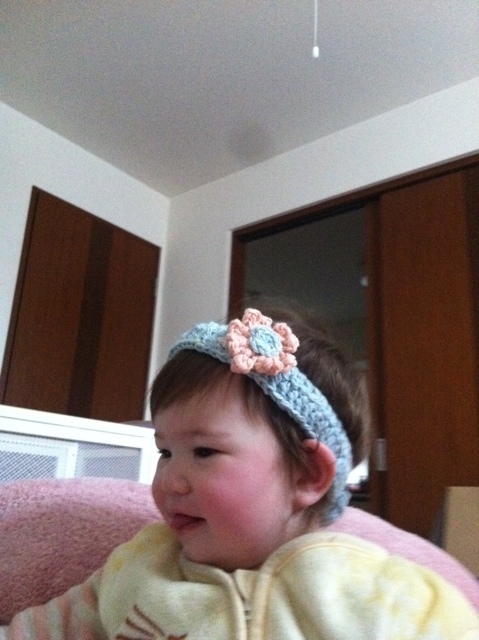 Now she’s wearing a new headband made by her mommy! There it is! Looking cute. After a busy day shopping at Costco, she took a nap.